No direct misconduct on Mark Cuban’s part, the NBA finds, but Mavericks owner did not pay enough attention to toxic culture. Cuban: "I'm just sorry I didn't see it. I'm just sorry I didn't recognise it" (file photo). 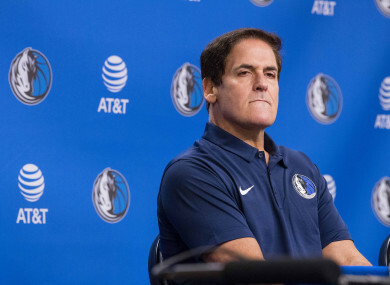 MARK CUBAN WILL pay $10 million to organisations supporting women’s causes after the NBA said he did not pay enough attention to the toxic workplace culture for women at the Dallas Mavericks. The Mavericks owner has escaped any punishment after agreeing to donate the money following a probe that revealed more than 20 years of harassment and improper conduct within the NBA franchise. “The findings of the independent investigation are disturbing and heartbreaking,” said NBA commissioner Adam Silver on Wednesday. “He is ultimately responsible for the culture and conduct of his employees. The NBA also launched its own investigation seven months ago after a Sports Illustrated article which detailed a workplace environment “rife with misogyny and predatory sexual behaviour”. Most of the allegations were directed against Terdema Ussery, the former chief executive officer and president who left the team in 2015. Cuban apologised on Wednesday to the women after the NBA said while there was no direct misconduct on Cuban’s part, he overlooked what was happening under his watch. In the SI report, Ussery was accused of multiple acts of inappropriate behavior, including sexually suggestive comments and inappropriate touching, toward female employees during his almost two decades with the team. Ussery, who was hired by the team prior to Cuban coming on board, denied the allegations to Sports Illustrated. Cuban said he fired some employees after learning details of the magazine’s report. Email “NBA owner donates $10m following 'disturbing and heartbreaking' investigation on workplace culture”. Feedback on “NBA owner donates $10m following 'disturbing and heartbreaking' investigation on workplace culture”.